A reward has climbed to $215,000 in the search for the killer of a veteran Baltimore police detective who was fatally shot in the head while on duty, the FBI said. Det. Sean Suiter, a married father of five and an 18-year veteran with the Baltimore Police, was conducting a follow-up to a homicide investigation around 5 p.m. Wednesday when he saw a man engaging in suspicious activity, police said. Suiter approached the man and was shot in the head shortly after, police said. Suiter's partner was nearby and rushed over to render aid, police said. Police officers respond to Bennett Place and N. Fremont Avenue after a call went out that an officer is shot, Nov. 15, 2017, in Baltimore. 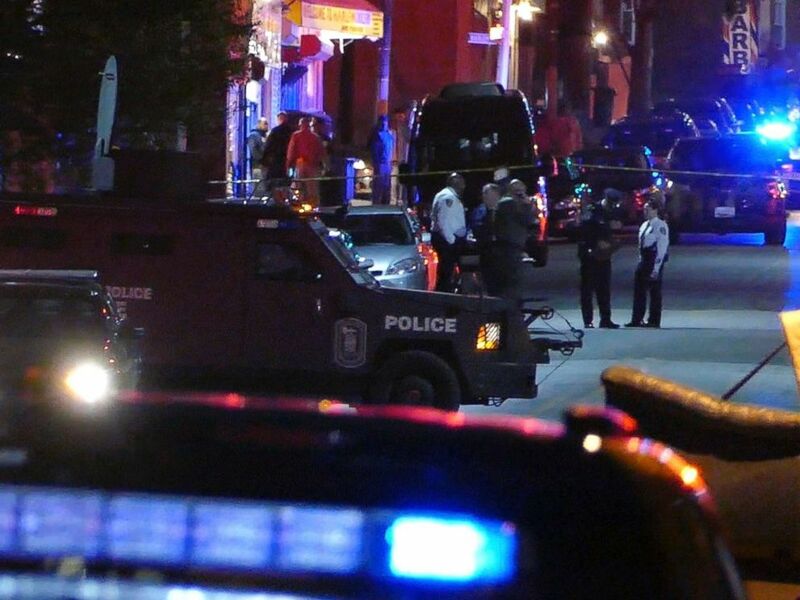 On Wednesday evening, Suiter was in "very, very grave condition" and was fighting "for his life," Baltimore Police Commissioner Kevin Davis said. Suiter, 43, died around noon Thursday, authorities said. Davis said Suiter was "a loved guy" who "loved being a cop." Baltimore Police Maj. Martin Bartness wrote on Twitter, "Suiter was my rock" as a new sergeant. "He knew his post; colleagues & citizens respected him. He was the man u wanted investigating ur case & patrolling ur neighborhood," he said. "Quick with a smile & big of heart, he is dearly missed. RIP, my friend." The manhunt is ongoing for Suiter's killer, whom Davis described as "cold" and "callous." Davis said that evidence suggests the suspect may have been wounded. He said the suspect is likely in the Baltimore community. 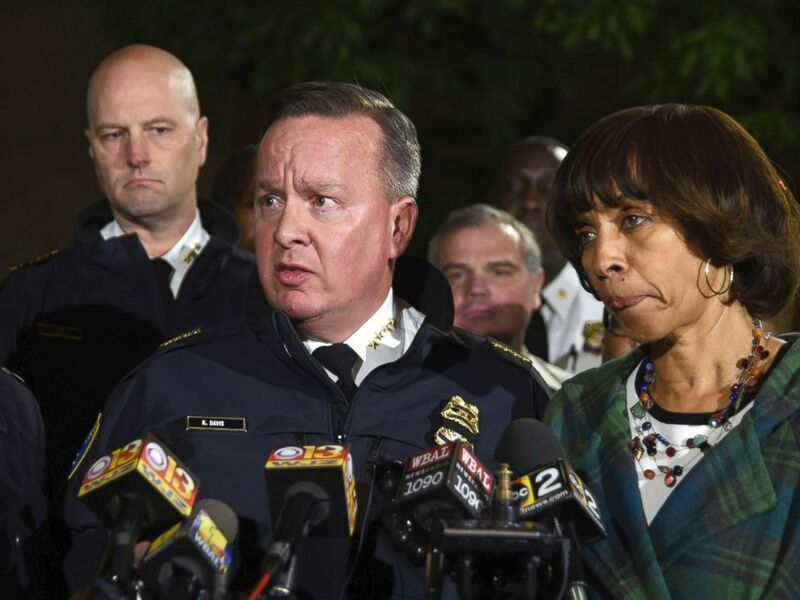 Police commissioner Kevin Davis, center, talks to the press after a police officer was shot, as State's Attorney for Baltimore Marilyn Mosby, left, and Baltimore Mayor Catherine Pugh, right, stand nearby, Nov. 15, 2017, in Baltimore. Davis said today that tips have come in, adding, "I encourage our tipsters to keep calling." "I know that our community is just as upset about this as we are," Davis said at a news conference this afternoon. "When a cop is killed, that goes way beyond that murder. It's an attack on American policing." 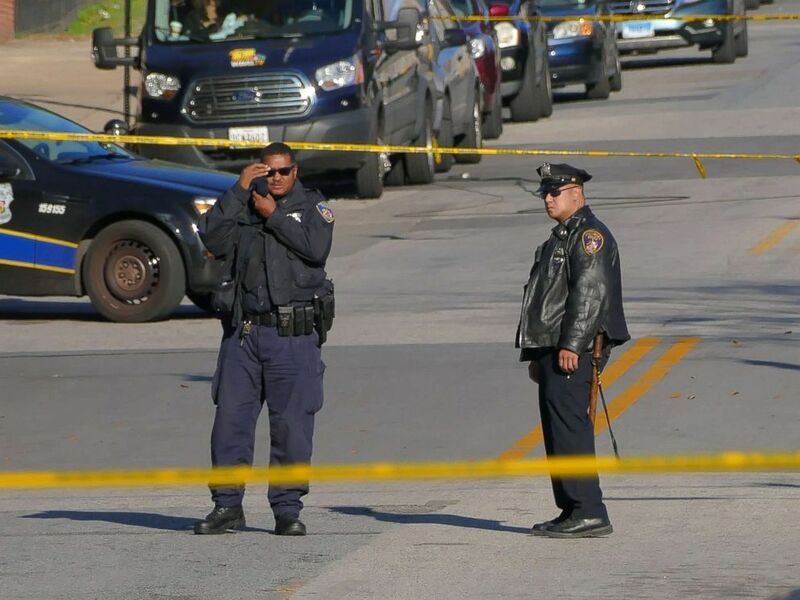 Police stand by inside a taped off area one day following the attack on a Baltimore Police homicide investigator, Nov. 16, 2017. 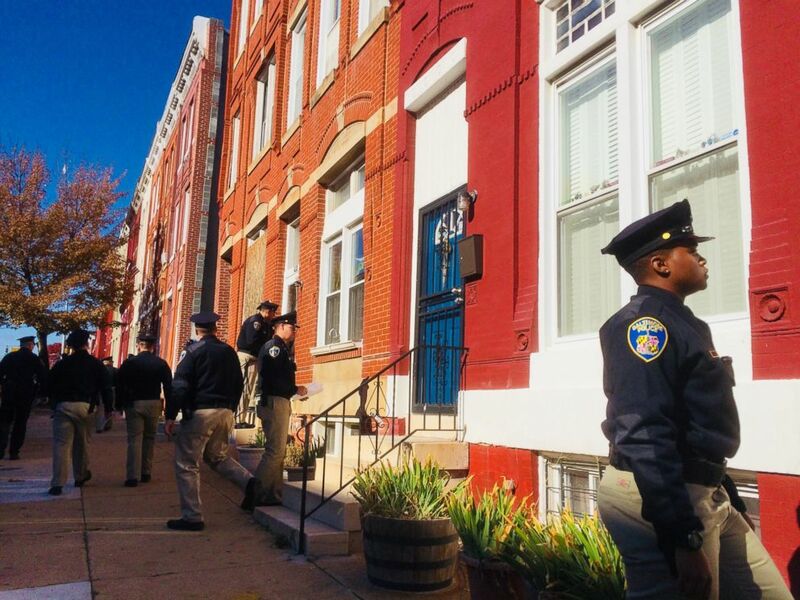 Baltimore police academy personnel canvass the area while detectives continue gathering evidence near the location where a police officer was shot, Nov. 16, 2017. Maryland Gov. Larry Hogan said in a statement Thursday, "It is difficult to express the sadness -- and anger -- that comes with losing this dedicated public servant to such a cruel and senseless act of violence. "The State of Maryland will continue to support local law enforcement as they hunt down the individual that committed this heinous crime, and ensure that the full force of justice is brought to bear," he added. "We join all Marylanders in praying for Det. Suiter's wife, children, and loved ones during this time of tragedy," Hogan said. "May God continue to bless the brave men and women who serve and protect us every single day, including all of Det. Suiter's fellow officers on the Baltimore City police force." The FBI in Baltimore said anyone with information can call 1-800-CALL-FBI.